In the State of Tennessee, there are two ferries. One of them is located in Houston County! Instead of a 90-minute drive, take a seven minute ride from Houston to Benton County. Operated by River Marine Services, Inc., and owned by the State of Tennessee, the Ferry crosses the Tennessee River at McKinnon. 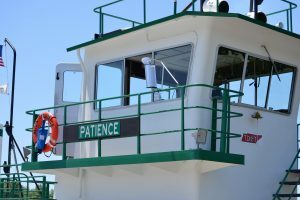 The ferry operates 365 days a year and runs Monday through Friday 5:30 a.m.- 6:00 p.m. and Saturday and Sunday from 6:00 a.m.- 6:00 p.m. Houston, Stewart, Henry, and Benton county residents may ride the ferry for 75 cents a day. Non residents may ride for $2.00. For more information, you can call them at 931.721.2776.